that longing to feel safe and taken care of will never go away, however old I may get. I just realized today, Father’s Day, that Daddy died 40 years ago. Forty years! And I’m nearly the age that he was when he died of a sudden heart attack, chopping wood in the back yard at the farm. It was hard to be young in a crazy time without his presence. Sometimes I wonder how much he would have liked the adult I became. I’m pretty sure he would have disapproved of many of the choices I made. But I am sure he would never have stopped loving me. I want to remember the good things, the tiny jewel-like memories that still remain: Daddy taking me to the department store (McClellan’s) and buying the doll I had wanted for so long, a small one in a green dress; Daddy standing with a group of uncles and cousins at a relative’s wake (we called it “receiving friends”) and laughing at Uncle Fatty’s jokes; Daddy coming in from the fields for lunch and drinking sweetened iced tea from a giant glass, which I still have. His khaki work clothes, how hard he had to scrub his hands with Lava soap to get the dirt and grease off from working in the fields or at Uncle Preston’s garage. Watching our black and white TV in the dark while he smoked a cigarette. I miss him every day. I’m sending out my love to him, and to all the fathers and uncles and brothers and grandpas who are father figures for children everywhere. Happy Father’s Day! I have Daddy’s denim jacket hanging in my hall closet. It is an old, faded Wrangler’s denim, lined with red plaid flannel, in the classic style worn by farmers and cowboys. When I came home from college in the fall or winter, I would borrow that jacket from him and wear it every time I went out while I was at home, unless he needed it to wear on the farm. Daddy always seemed the right size to me, not too big and not too small. He would be considered barely medium height now, barrel-chested, with strong shoulders and muscular arms and legs. 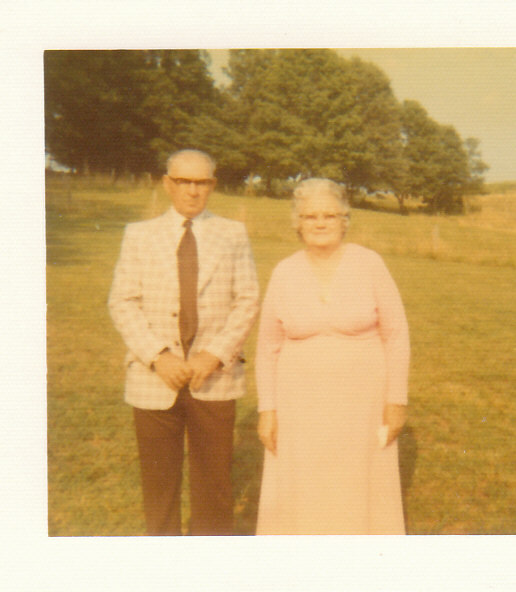 He wore khaki work pants and shirts when he worked at Clarksville Base, and he wore them to work on the farm. They were heavy cotton and were a pain to iron, but I learned to iron on those work clothes. When the weather was colder he put on heavy, lined coveralls which zipped up the front and were dark green or dark grey. All these clothes were meant for hard outdoor work, mending fences, herding cows, digging postholes, the work that couldn’t be done from a tractor or a truck. When it wasn’t cold enough for the coveralls, he wore that jacket. Many times I saw him put it on as he headed out to drive the school bus (when he had that job) or feed the cows just as the winter sun was coming up. So after Daddy died, when Mother was cleaning out the house, that jacket was the only thing of his I wanted, and the only thing I brought home to New York with me. I have never worn it again. I guess I was afraid it would wear out. It is quite frayed, and, I just realized, more than 30 years old. But it is a last bit of him, and of frosty mornings when the cows patiently waited for him, lining up at the barbed-wire fence nearest our house, their breath making clouds. “Hello, babies,” he would say, and they followed him at a stately pace to the stable, to be fed. Happy Father’s Day to all fathers, and to all of us who love and remember them. My book group read a fascinating book this month–not an easy read, but it led to a lot of questions and a great discussion. “Austerlitz” by W. G. Sebald was the book, a novel ultimately about a man searching for his origins and his lost family, a child of the Kindertransport. We talked about a number of themes in the novel and how it was structured and narrated. It had a dreamlike quality, but also conveyed the destructiveness of buried memory and lost history. One of the members of our group raised the question–what is your earliest memory? She is a psychotherapist, and she said the stories people tell about their earliest memory often encapsulate all the issues they deal with throughout their lives. I thought this was amazing. One of our group members had clear memories of being in the hospital at age three, and how frightened and abandoned she felt. Most of us had no clear memories before age four or five. I started thinking about it, and realized I just had an impression of emotions before I was four or five (and a clear memory of the family’s cocker spaniel, Janie, who died before I was five years old.) Between four and five I learned to read, and I clearly remember the moment when I was sitting on Daddy’s lap, looking at the Sunday comics. He was reading them to me, and I suddenly realized I knew what the words meant. It was like being struck by happy lightning! I started reading to him, and he was so proud. Hence my lifelong love of words and books. I felt warm, safe, happy and loved, and my brain was totally charged up. I ruled the world! What could be better? What do you remember? What is your earliest memory? I hope it is warm and happy. Growing up on a farm, I was familiar with the sound of owls calling at night. Most owls really don’t hoot, in my experience. Screech owls were the most frightening–they sounded like a woman screaming in the woods. Many a night I heard them shrieking to one another in the distance. We had a tobacco barn that was about two stories high, at least. It was used for firing dark tobacco. There were beams running across from one side wall to the opposite wall, spaced so racks of tobacco could be hung to dry. When it had dried enough, Daddy would build a smouldering fire with sawdust and keep it going for days, firing the tobacco. Climbing up in the barn was perilous work but had to be done. Usually the younger and stronger ones did that and hung the tobacco. In the spring and summer the tobacco barn was empty, and that’s when the barn owl came to hunt mice, and sometimes just to perch. One day Daddy called me to come with him and “see something special.” We trudged down the rocky dirt road to the tobacco barn, trailed by my dog, Dusty. I named him that because he was the exact color of that dirt road. Daddy opened the smaller door within the big doors so we could go in, letting a little daylight in to the shady, cool interior. “Look up in that corner,” he said. There was a huge barn owl. It slowly turned its head and stared down at us with yellow eyes. Dusty was nosing around the dirt floor of the barn, and the owl watched him intently. Then it spread its wings and flew out through an open hatch on the side wall. It seemed to fly in slow motion, as if you could see every feather moving precisely. 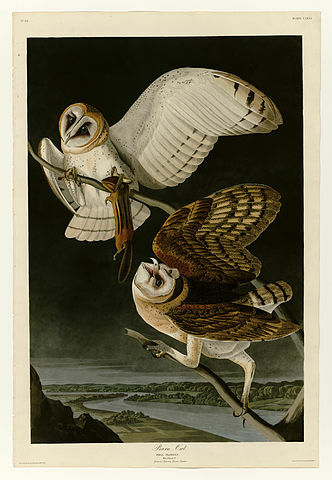 When I saw this Audubon print it reminded me of that owl. I can see why owls were Athena’s bird and associated with wisdom. That level stare implies knowledge and intuition beyond what we know. My father was a quiet man, but he had firm convictions about the right way to do many things (see Father’s Day Special II.) My view of pumpkin carving for Halloween is heavily influenced by his. Every year just before Halloween we would go looking for a pumpkin. Daddy felt that the proper shape for carving was the classic round, not one that was taller than it was wide. It should be a good healthy orange, not pale. The reddish-orange ones you sometimes see nowadays were not available back then in Tennessee. We usually chose ours from a farm stand along 41-A, someone’s local produce. The first step in pumpkin-carving was to spread a great deal of newspaper on the dining room table, covering the vinyl tablecloth so even it would not get dirty or be stained. If the weather was warm sometimes we did this outside. Step two: Daddy carved a circle around the stem about six inches in diameter and pulled out this plug of pumpkin meat. He cleaned off the bottom of this. Then he scraped out the seeds and as much of the pumpkin meat as he could from the inside. The next step was crucial, and this is where his opinions come in. Daddy took a pencil and drew the face he wanted to cut onto the pumpkin shell, following these rules: 1) Halloween pumpkins should have triangular eyes. 2) They should have noses, either a triangle pointing in the opposite direction from the eyes, or two nostrils (some artistry permitted here.) 3) Their mouths should have teeth, either square and snaggled or pointed. 4) They should have ear holes. So he carved according to these rules. The pumpkin was lit by a stub on candle. We would wait until dark, go outside and light the pumpkin, and stand in the dark admiring its eerie beauty. Every year I was entranced with the result–old-school, simple, classic, and vaguely threatening. This year I will have company for Halloween, and we will go to the Blaze in Croton to see thousands of carved jack o’lanterns, very fancy indeed. But maybe I’ll carve an old-time one, in memory of Daddy. My daddy was a man who considered there was a right way to do anything, whether it was repairing a car engine or eating cornflakes. He was not dictatorial or oppressive in any way. Daddy just knew what he considered right, and he demonstrated how to do things, expecting you to follow his example. When my nephew Jarrett was quite small, my sister Juanita and her family stayed on the farm with my parents for several weeks while they were in the process of moving to Kentucky. Jarrett and his brother Mason followed Daddy around and absorbed his every utterance, but Jarrett was particularly impressionable. Daddy’s lessons weren’t always absorbed. He tried to teach my brother to work on a car engine, but Gil preferred to bounce a tennis ball off the side of the house. He never managed to teach Mother to drive, because she would get nervous, he would get gruff, she would dissolve in tears, and the lesson ended. 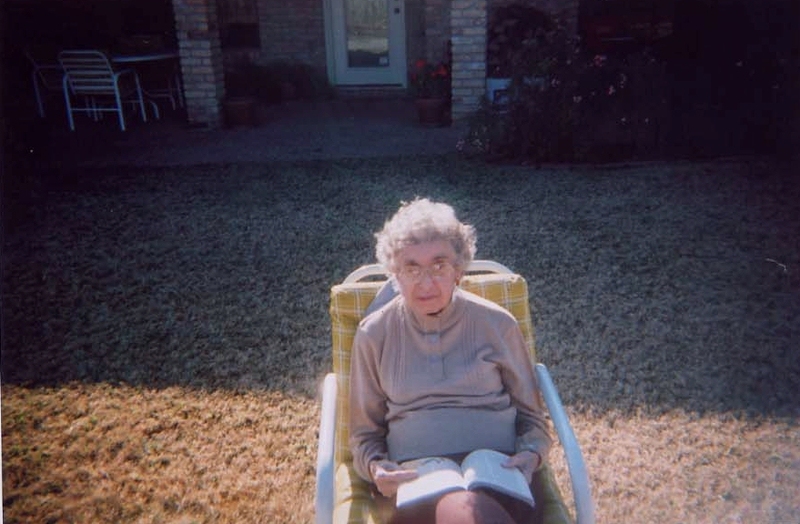 Consequently she was dependent on other people for transportation her entire life. But some of the lessons did sink in. He taught me to change a tire after I had two flats in one week. I had to jump on the crowbar to loosen the lug nuts, but I could do it. It stood me in good stead for many years. Daddy died of a heart attack when I was 22 years old. I miss him to this day. Happy Father’s Day to dads everywhere. Your daughters love you. I’m the youngest of five children, and there are almost 20 years between my oldest sister and me. Daddy turned 40 years old not long after I was born. 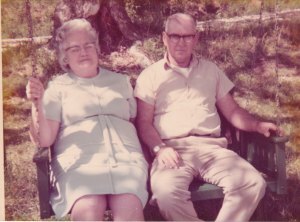 That’s not unusual today, but in my parents’ day they were considered old enough to be grandparents! There are seven years between the next-to-youngest and me, so I’m sure Mother and Daddy thought their family was done long before I came along. You’d think they would not have been pleased, but from all accounts they were thrilled. Even when I was a teenager, Daddy still spent time with me and did things with me, difficult as that was for him with a girl who wasn’t athletic, and at a time when we didn’t have money to spare for movies or dinners out. One inspiration he had falls squarely into the “don’t try this at home” category. It rarely snowed more than a dusting in our part of Tennessee–ice storms were more prevalent. So any snow was a huge treat and a special occasion. One winter we got a few inches of snow, and school was closed. I had a sled, but the runners kept getting bogged down in the wet snow. Then Daddy had his big idea. 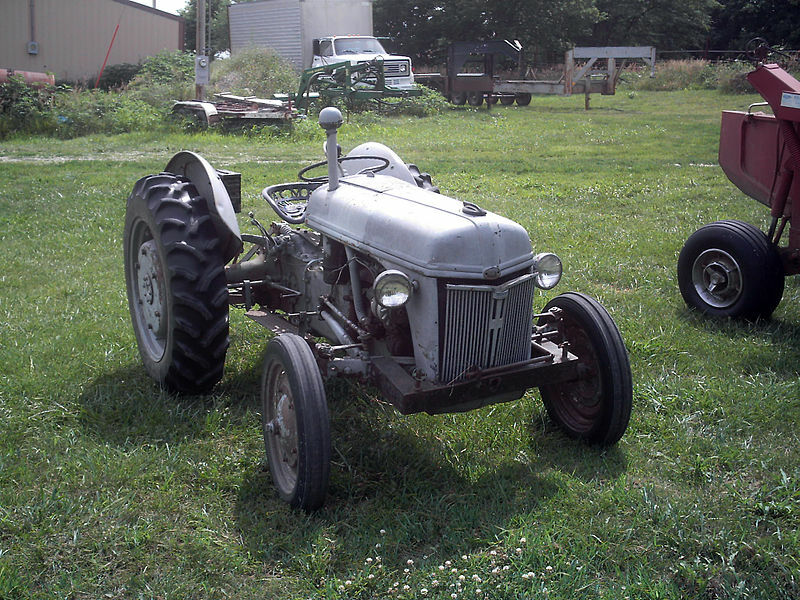 He took a discarded car hood from my uncle’s garage, and chained it upside-down to the back of his tractor. “Get on the hood, baby doll, and hold on!” he said. We spent a good part of the afternoon going up and down the slushy, ice-slick road with the tractor and car hood. Looking back on it now, I wonder why the hood didn’t slide into the tractor’s rear wheels, and how on earth I kept from falling off. But I had no problems at the time, and it was exhilirating to ride and slide in the cold. Finally we went home, and Daddy unchained the hood. My boy cousins next door had been watching enviously. “Uncle George, could we use that car hood?” Dale asked. Daddy said they could. Dale and Don launched themselves down a hill, completely unable to steer the hood. They hit a tree and Don broke his arm. Oops! Like I said, don’t try this at home!